This will be a new feature on this site, and here's my explanation. 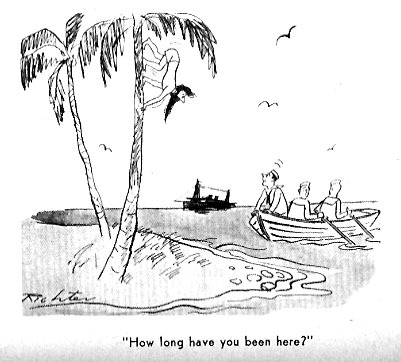 First of all, I've been showing you lots of my own cartoons that were published as long ago as 1957, and I realize that many of those old drawings and gags look real amateurish. But they are out there for all to see, and I will continue to post them no matter how personally embarrassing they may get. Second of all, I have a huge collection of hardcover and paperback cartoon anthologies and cartoon magazines. Some of these date back to the early 1940's. What I plan to do is go through this collection, and whenever I see an early cartoon by a "big name" (living or dead) cartoonist, I'll post it for your examination. I've come across many such early cartoons, and quite often there are dramatic differences in the drawing style, and humor, of the cartoonist at the beginning of his/her career. 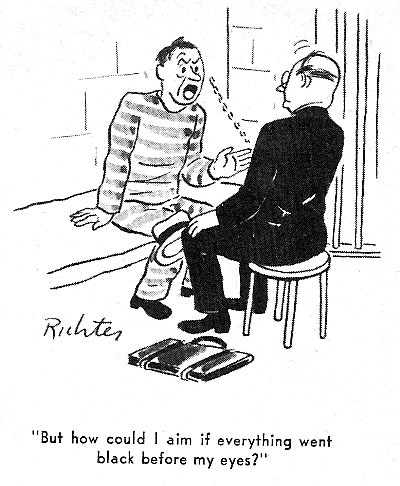 For instance, as Case in Point No.1, here are some cartoons by the late Mischa Richter, from a book published in 1944. The title is "The Good Humor Book", and although it's hardcover, it looks like a low-paying anthology. 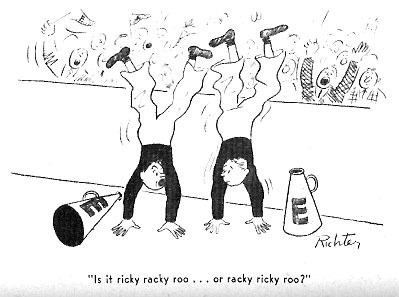 It contains hundreds of cartoons, including many "regulars" of that era, like Jack Markow, the four Roth brothers, Hank Ketcham, Adolph Schus, Ed Nofziger and Gardner Rea. But these guys were all in their heyday, and their drawing styles had already evolved. I'm only going to post cartoons of artists whose styles were still emerging. You probably wouldn't be able to identify them, if the signatures weren't there. 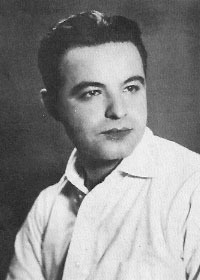 I've also included a photo of Mischa Richter from the 1940's. 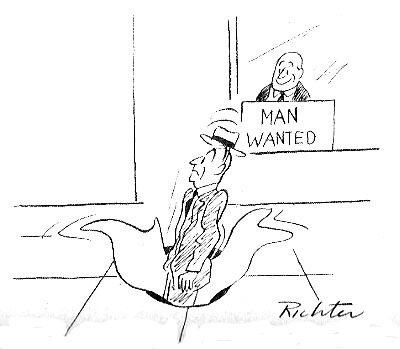 To follow Richter's professional development, just check out his cartoons in The New Yorker, or look him up in The Cartoon Bank. Should be a great recurring feature -- looking forward to more. i think i won't know many of the cartoonists but there are a lot of people who will. great idea!! I love that book - I remember reading it. The picture of Mischa kinda scares me for some reason. Yesterday I baught, from a street vender a framed cartoon (mat is 16" x 20 1/2" and inside the mat is 12" x 17") by Misacha Richter. It shows a grecian looking woman gazing at a Grecian looking man who is holding up a cup, his eyes turned upward as if he is thinking. The caption is "It's good ambrosia, but it's not great ambrosia." I believe it is an original and probably never publisehd anywhere becasue on it is written "To Georre E. Lang - with warmest reagards - Mischa Richter" And, because of the gustatory theme, I think the recipeint was probably the George Lang who owned Cafe des Artists and wrote cook books (although I have not been able, so far, to confirm that his middle initial was E). Can you provide any insight about this cartoon, how and where I can get it autheticated, it's possible value if it is an original that was not published (although I think I will not sell it)? And who might be able to confirm that Mischa knew Lang and likely frequented Cafe des Atitists? I love it, Eli. Richter had an influence on me. I thought it was a New Yorker Cartoon so I was looking for the image online by googling. Pity. My mother was his first wife and it was framed and on the wall of our music room. I remember it. He died in 2011. I guess his third wife got rid of it. Yes, his middle initial was E. for Ervin. In the 60's, when he was Vice President at Restaurant Associates, I remember the name plate on his desk said, "George E. Lang." He dropped it, and his mustache, and a few other things. This was in the 60s. He bought the Cafe in the early 70s during or after his second marriage. It predates his ownership there. I don't know who Mischa Richter is. Third addendum. But he had many artist friends. He was an artist himself. I remember we were close to puppeteer Bill Baird and his family when I was little. And Thomas Hoving, then director of the Metropolitan Museum of Art, and his family. I reached this site by googling, looking for that cartoon by keyword. Ha Ha. There is Mischa Richter, right at the top, there. And after I went to Wikipedia. Silly me. 6th adddendum, I remember hearing decades later, possibly from him, I don't remember, that Hoving wanted to exhibit his work but he refused. He, like my late sister, Andrea, was a cartoonist, he drew the famous caricature of himself, but he worked in many media. Most of her work was destroyed in the fire, but one awesome cartoon can be seen on the website of the Andea Lang Fund of the Santa Barbara Museum of Contemporary Art. I never learned to draw worth a damn, but I did win First Prize for the Humanities and Social Sciences in the City University of New York Scholars Day Competition in the early 90s for a half hour slide show, lecture and Q&A I delivered entitled, "Thomas Nast and Historiography of the Political Cartoon in Reconstruction-Era America." Milton Glaser was another close friend of his. They wrote "Lang's Compendium of Culinary Nonsense Together" His text and Glaser's cartoons. A photograph of a cake he had written calligraphically in icing was exhibited at the NY Museum of Folk Art in the 70s. I remember finding it online somewhere years ago after his death by googling for it. I don't remember whether I mentioned that he once mentioned casually that he had refused Hoving's offer to exhibit his work at the Met. He was a serious perfectionist who idolized and emulated Renaissance artists. He was also good at adapting, rationalizing and philosophizing about both. I remember him telling me in the 70s that he had decided to accept Jackson Pollack's work as art. Didn't think to ask by what route he had arrived at that after my having heard him foam at the mouth on the subject so often. To late to ask. I never learned to cook either. We were both admirers of Nixon though. Nixon appointed him to the head of the Open House Committee of the Bicentennial Commission. I like Nixon because he saved Israel during the Yom Kippur War and he gave me my favorite dish, aside from Instant Ramen and NY Cheese Cake: Cottage Cheese and Ketchup. Thus arriving at the same place for different reasons, as is often the case. 10th? and Final Addendum: I've been quoting that cartoon "it's good ambrosia, but it's not great ambrosia" to people all my life. Now, that I decided not to be to lazy to put quotes around my search string, I know why I've never been able to find the damn thing. You really oughta publish it somehow. It's priceless humor. Real humor. The real thing. Ambrosia. Not "well". top shelf. The good stuff. My father had an expert's eye for art and was always finding things in junk shops or at auctions whose true value the owners had no idea of. When my parents lived in Italy in the early 50s, My mother won an opera Fulbright as a Soprano and my father went along with her and won a scholarship in Italy from the Accademia de Santa Ceccilia, the oldest music school in the world, on violin, they were poor but my father would find all kinds of valuable art like that and buy it for a song, no pun intended. He recognized and bought a big section of the same medieval unicorn tapestry in several pieces in different shops in Europe, sewed them together and mounted it. Still in the dining room of my mother's apartment where he last lived nearly 50 years ago. And his last wife, having no idea of what she was in possession of, tossed it so you would pick it up, presumably for a song, from a street vendor. The irony is simply precious. I love it, It's hilarious. Who says God has no sense of humor? Mazeltov! Mount it in good health. Please publish it so we can all send links to it to our friends. Well, my mistake. the original is still in my mother's music room. She says he got it from Richter when he was assistant banquet manager of the Waldorf Astoria in the mid 1950s. But, though it's signed by Richter it is not dedicated. If yours is dedicated, could Richter have drawn him another one from scratch? He got laid off from RA within months of ending the marriage in November '68. He wore a lot of hats at RA but towards the end, in addition to being VP of the fine restaurants division, he was director of the Four Seasons and Brasserie restaurants in midtown so maybe it was there unless it was independently as members of the same circle of artists and other celebrities. But, he dropped the "E" before the cafe I am fairly certain. Looks like there are two originals. Is Archimedes in the house? "Yes, I'm Archimedes." "Hi, Archie, how yah enjoyin' the show?" Sorry, it's the "ship of theseus." Really! Can't take me anywhere! Perhaps his second wife, Karen Zehring, would remember. I googled her and it seems they were married until the late 70s. Funny, I really don't remember. Her second husband seems to have been the film director Peter Davis, to whom she was married util the '90s. Best I can do. Good luck.